Posted 9:09 pm by ENDURrun & filed under 2018. At ENDURrun, we try to celebrate our champions. We did a fun photoshoot with our winners Robert and Valery today, and asked them some questions along the way. It’s so easy for us to publish their stories because the humble drive they share certainly resonates with the community. Robert Brouillette is a prolific ENDURrun champion, having won this event for four consecutive years, with the 3-6th fastest times ever. Who has helped you achieve this? In 2015 I had the help of the Health & Performance club to train with 3 times a week, with lots of support from the members and guidance from coach Sean who has trained ENDURrunners before me. For the next 2 years I trained with an elite teammate. This year I trained on my own but still did some training with a bunch of different friends around the area. You won by over an hour, again. How do you find motivation in battling historical times? Even though I’ve comfortably won each year I find excitement in challenging my own self and Charles Bedley’s ghost of the past who holds cumulative and stage records. A lot of my times are within a minute and some just seconds of EPB’s and records so every stage needs to be a solid effort. Were you happy with your performance this year? I am surprisingly happy with my effort this year even though I didn’t continue the trend of getting faster each year and ran my second fastest cumulative time ever. This makes me happy because I ran a respectable performance even though unfortunately I had some personal life things that impacted my training this summer building up towards the event. Did you have any idea in 2015 that this was possible? In 2015 when I ran my rookie year of the event I was confident I would do well because I’m fortunate to have the athletic qualities needed to race back to back, recover quickly and run high hard effort mileage “comfortably”. I could see this from my training and how my body responded to this type of running style leading up to my debut. What does four consecutive wins mean to you? The wins show that the unique race format of the event allows me to show my strengths of multi-day racing and do well enough to defend my title. In the past years it’s been more about stage records and overall cumulative time goals rather than placing that I’ve needed to focus on. It’s always a pleasure to win regardless of current fitness, other competitors and event conditions which all change year to year. Running my 2nd fastest overall time ever and top 4 all-time is cool. I’m most pleased with a new stage 3 Bechtel Park 30K XC PB beating one of the event record holders stage times by 3 seconds. A close second would be how I ran a strong consistent marathon on the last day after 120K of racing in my legs. I have already signed up for next year looking to defend my title once again and hopefully with some better training behind me, have a better shot at some records. Do you hope to be more challenged in 2019? In my experience over the year I’ve found that regardless of who’s in the race I always give 100%. However, it’s possible having a physical runner ahead of me or chasing right behind me rather than a ghost runners (chasing time records from the past) might give me that little bit more of an edge to push harder. Do you think an Ultimate male will ever go sub-2:30 in the marathon? Currently the top 2 ultimate marathon times are 2:32 and 2:35 with my best at 2:36 so in order for me personally to ever have a shot at a stage record or cumulative overall time record I would certainly need to be around 2:30 and under to give myself some cushion room. The marathon is actually one of the easier stages for me physically and time record wise as I find stage 5 (16M XC) and stage 6 (10K TT) to have the hardest records to beat. Valery Hobson won the Ultimate for the first time in her third attempt. She had a rare opportunity to share the Gold Jersey with her teammate and competitor Robyn Collins, and in the end, prevailed in a tight and grueling contest. When did you think this was possible? Stage 5. The races had been fairly close up until then but I was always just a bit shy of winning despite running my heart out. lol Chicopee is a different beast altogether. It’s not like any of the other stages and I truly believe that if you don’t make a concerted effort to train hills and trails you have no clue what you are in for there. When Lloyd held the timer out for me and we watched the time go past one minute thirty…..the tears started flowing. And because the gap became over 7 minutes, it made me think maybe it truly was possible. What does it mean to join the Gold Jersey Club? My running has definitely improved since joining H+P 3 years ago. My team and the friends on the team that I run with and train alongside have certainly played a huge part in my personal success. The running community as a whole is such a supportive and encouraging community. We all have our own goals but push each other to be the best we can be. The ENDURrun family is also a tremendous force in encouragement and support. There is a camaraderie and spirit there unlike anywhere else. And of course my family who continually support me and encourage me to be the best I can be. You are a rare case of in three Ultimates, always bettering your previous times. How do you do it? Hmm…..I am a bit competitive. Especially with myself and I always strive to do better. And as I mentioned, training with H+P has definitely helped. Being able to train with people who push you and make you try harder and encourage you to do better helps for sure. I also seem to have a decent ability to recover quickly….which helps with back to back training days and racing days. What were you most pleased about ENDURrun 2018? From a personal achievement standpoint: the OA win obviously….more specifically, the last 3 stages. Chicopee was the turning point, my 10k was a PB the following day, and I was extremely pleased with my marathon. I had no idea I’d run such a solid time. From a general standpoint: the family of runners and friends and family and volunteers….all the parts of the week that make it such a special and wonderful event. Why are you signed up again for 2019 already? I made a promise to myself. If I ever win ENDURrun I will immediately sign up for the following year as a gift BUT, I will run it strictly for fun. After 3 years of running my heart out and giving it my all….I want to experience it from a different perspective. I want to remove all pressure and expectations. I think it’s the best gift I could ever give myself as a reward for my win. I’m looking SO forward to 2019!!! Did you know you’re the oldest ever ENDURrun champion? Oh wow. No, I did not know that. Oi. I think this is what I am most proud of. To win the gold jersey at any age is such an accomplishment, but knowing I did it as a master with the big 5-0 coming around the corner is icing on the cake. This project started last year when we went to Chicopee with Robert and Vicki. This year’s photos were from Bechtel Park, and we also added the interview component as well. We plan to continue to make this a tradition that honours the male and female ENDURrun champions. We have 8 male champions in 16 years, and 11 female champions in 15 years. Only about half of the time has the previous winner returned to race the following year. We are super lucky to have both Robert and Valery proudly declaring their intentions already, no matter what they plan to do. 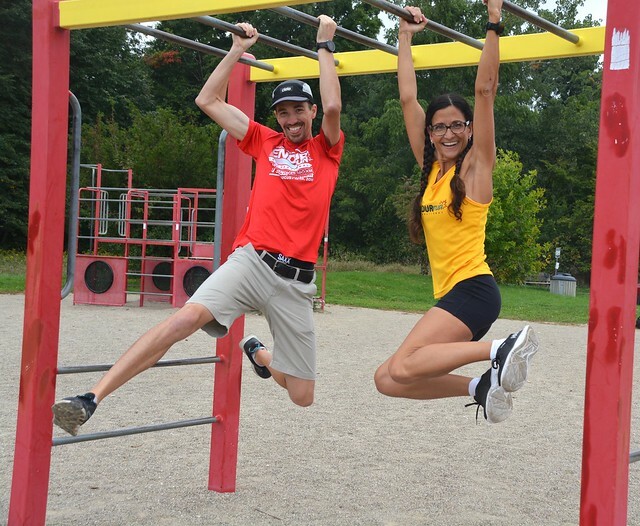 They are great ENDURrun ambassadors. You look great in gold!